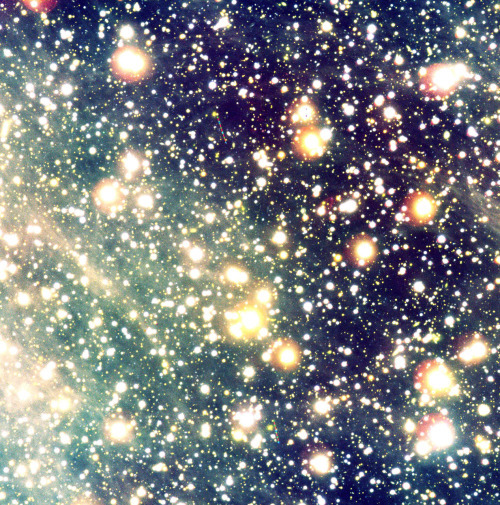 False-colour composite photo of the sky field with the lonely neutron star RX J1856.5-3754 and the related cone-shaped nebula. It is based on a series of exposures obtained with the multi-mode FORS2 instrument at VLT KUEYEN through three different optical filters: R (29 exposures of 136 sec each; ~1.1 hrs total; here rendered as green); H-alpha (19; 1020 sec; ~5.5 hrs; red); and B (10; 138 sec; ~0.4 hrs; blue). The seeing was good to excellent during the exposures (0.66 arcsec on average). The trails of some moving objects, most likely asteroids in the solar system, are seen in the field with intermittent blue, green and red colours. The large field measures 6.6 x 6.7 arcmin 2, with 0.2 arcsec/pixel. North is to the lower right and East is upper right. The motion of the neutron star as seen on the sky (see the text) is towards East, exactly in the direction indicated by the nebula. Wow. I would have never known this if I didn't stop by. Thanks! The universe is so beautiful, but it's nice to know a bit of info about it thank you following.